Vertex Standard VXR-9000 delivers the reliable performance and extended range needed. The slim-line design is crafted for easy installation and integration into most repeater sites. May be programmed with up to 32 channels and can perform in repeater or base station mode. Includes Priority Channel scanning for efficient communications monitoring. 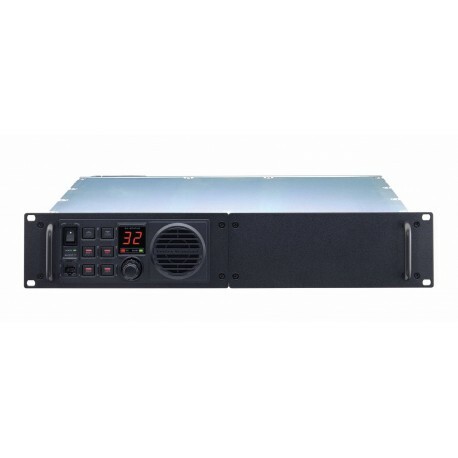 If DC power fails at the repeater site, the VXR-9000 will automatically revert to a backup DC power source if connected. Under backup DC power, the repeater will transmit an alert message to notify the operator that immediate attention is required at the repeater site. May be programmed to perform a five-step sequence of commands for certain operating events. For example, during a DC power failure when the repeater switches to a backup power supply, the repeater can be programmed to switch to low power and send a CW ID advising of the situation, etc. The cooling fan diameter is 3+ inches and thermostatically controlled to ensure a stable temperature environment. Fan operation may be programmed for three options: off, continuous or temperature-controlled, depending on the application. A malfunction alarm is also included. The 50 Watt VXR-9000 is designed for simplex mode with single-antenna operation or full-duplex mode with the optional VXD-60 duplexer when optimal communications is necessary at all times. Available for 50 W model only.